The garam masala spice added hints of coriander, pepper, cumin and cinnamon to this dish and I absolutely loved the flavor. Combine chickpeas through cauliflower together in crockpot. 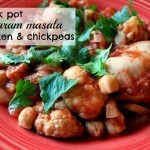 Place chicken on top of chickpea mixture and spoon mixture over the chicken to cover it. Allow everything to cook on low for 6 – 8 hours. Spoon into four dishes and garnish with cilantro and a dollop of plain Greek yogurt or sour cream.